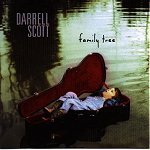 On his second record for Sugar Hill Records, Darrell Scott continues with his Americana-roots brand of music, showing that he is much more than a hot session player for the stars -- he is a talented songwriter who can make great music backing up others or fronting the songs himself. With FAMILY TREE, Darrell takes an autobiographical approach to family life, sharing his stories with the world -- both good and bad. Opening with "My Father's House," Darrell quickly establishes the album as a well-rounded, strong-willed, truthful disc from every angle. The lyrics are clever and full of heart, whether the topic is sad or happy, and Darrell's voice makes everything seem that much more powerful. Then there is the music, which lures you in even more. The lyrics are good, but it's the music that draws all your attention (with the help of his gusty vocals). "Double-Headed Eagle" is another stand out track on an album that showcases just how delicate, painful, and edgy Darrell can be with so little. Light percussion and gentle guitar slip under his quiet voice while the rest of the instruments slowly intertwine with everything else, creating a very potent, emotionally-charged blend that will have you in tears one moment and smiling over the detail they give the song just moments later. Never losing sight of his original goal -- to put his family tales to music -- Darrell seems both fearless and shy when he puts everything on the line. "The Hummingbird" adds a little bit of a bluegrass tingle to his country-Americana-roots style, giving the song a bit more flavor for your ear. Relying on vocals, a mandolin, and his guitar, the song shows Darrell at his softest, yet his voice and playing can still be heard quite well. Darrell has a way, through his honesty, of making everything gently subtle, while having it also be obvious and emotional. His voice is full of emotions and heart, which tells you he's singing about his own life, which validates the music even more. While the people he does studio work for may be pouring out the hits for their commercial fan base, Darrell creates an album for himself, and doesn't seem to mind if nobody, or the whole world, gives it a listen. Here is therapy at its best, for both the listener and the singer. I'll give it a B+.